Pictured here is an earlier version of a Bacon # 6 Ne Plus Ultra. 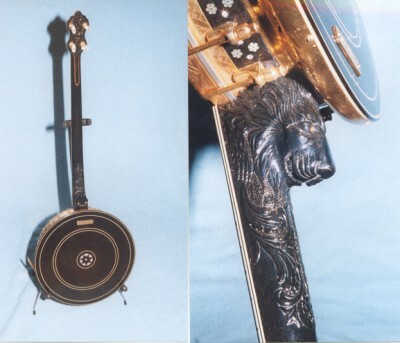 It has the classic, catalog resonator, but it is somewhat more ornate in other respects. 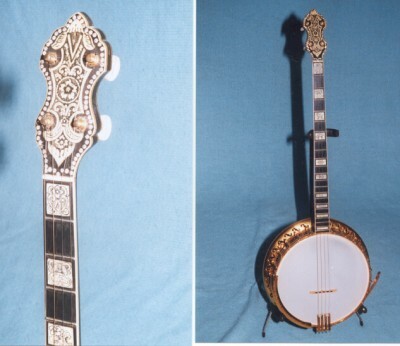 There are numerous white rhinestones in the headstock, as well as colored ones around the hoop rim. The lion carving on the heel is the earlier version, being the so-called "smiling lion". With a serial number of 17854, it was probably made around 1926. The wood used is of course ebony, and the position marks are inlaid with ivory, engraved with original designs. 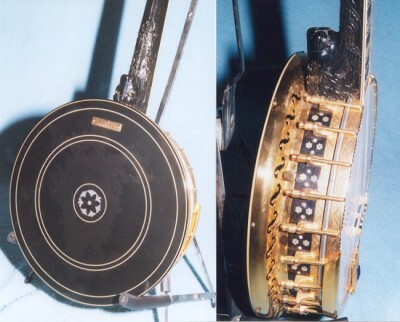 The resonator sides and back have the usual #6 mother of pearl inlays.